1）Miyake T, Kung CK, Goldwasser E. Purification of human erythropoietin. J Biol Chem. 1977; 252: 5558-5564. 2）Jacobs K, Shoemaker C, Rudersdorf R, et al. Isolation and characterization of genomic and cDNA clones of human erythropoietin. Nature. 1985; 313: 806-810. 3）Lin FK, Suggs S, Lin CH, et al. Cloning and expression of the human erythropoietin gene. Proc Natl Acad Sci USA. 1985; 82: 7580-7584. 4）Erslev AJ. Blood and mountains. In: Wintrobe MM, ed. Blood, pure and eloquent. New York, McGraw-Hill; 1980: 257-280. 5）Reissmann KR. Studies on the mechanism of erythropoietic stimulation in parabiotic rats during hypoxia. Blood. 1950; 5: 372-380. 6）Erslev A. Humoral regulation of red cell production. Blood. 1953; 8: 349-357. 7）Jacobson LO, Goldwasser E, Fried W, Plzak L. Role of the kidney in erythropoiesis. Nature. 1957; 179: 633-634. 8）Bonsdorff E, Jalavisto E. A humoral mechanism in anoxic erythrocytosis. Acta Physiol Scand. 1948; 16: 150-170. 10）小宮悦造. 造血促進物質ノ命名ニ就テ. 熊本医会誌. 1936; 12: 2355. 11）坂元正徳, 古谷範夫, 上野達也. Erythropoietinニ就テノ臨牀的研究. 熊本医会誌. 1937; 13: 1681. 12）Tokesi H, KawakitaY, Miyake T, Dekita K, Takekuma Y, Kusumoto Y. Studies on the congenital methemoglobinemia. I. Case report. Kumamoto Med J. 1964; 17: 182-186. 13）Kawakita Y, Tokeshi H, Miyake T, Fukutomi J, Dekita K. Studies on the congenital methemoglobinemia. II. Diaphorase activity. Kumamoto Med J. 1966; 19: 211-219. 14）Uchida M, Kiyama T, Miyake T, Kawakita Y. NADH diaphorase in erythrocytes. I. 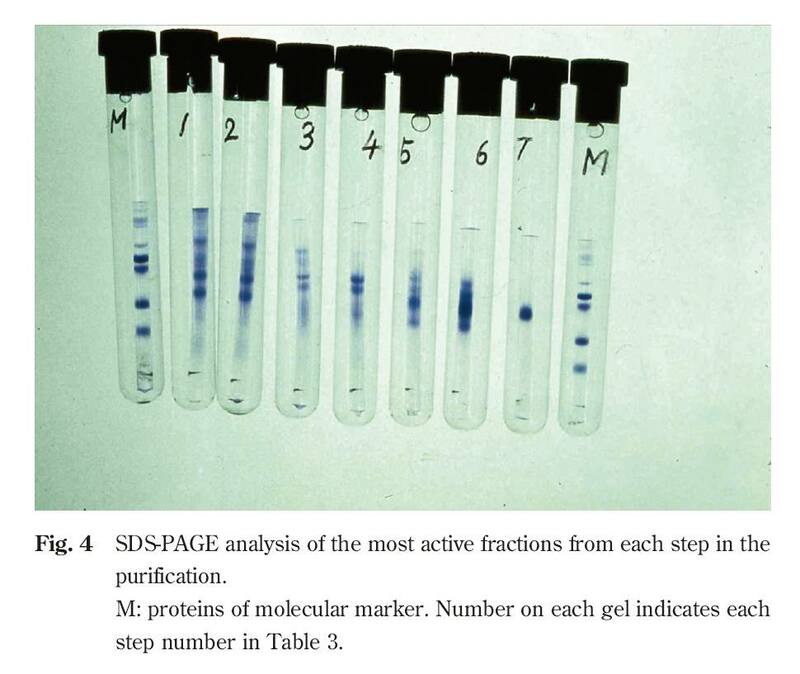 Partial purification of diaphorase. Kumamoto Med J. 1971; 24: 87-94. 15）Kiyama T, Tokesi H, Kusumoto Y, Takekuma Y, Uchida M. Studies on the congenital methemoglobinemia. III. Mass survey. Kumamoto Med J. 1973; 26: 57-62. 16）Takekuma Y, Kusumoto Y, Dekita K, Miyake T, Kawakita Y. A family of thalassemia minor. Kumamoto Med J. 1970; 23: 146-149. 17）Kagimoto T, Tanaka M, Miyake T, Kawakita Y. Physiocochemical study on Hb M Kumamoto. Kumamoto Med J. 1972; 25: 25-32. 18）Hennessy TG, Huff RL. Depression of tracer ion uptake curve in rat erythrocytes following total body X-irradiation. Proc Soc Exp Biol Med. 1950; 73: 436-439. 19）Plzak LF, Fried W, Jacobson LO, Bethard WF. Demonstration of stimulation of erythropoiesis by plasma from anemic rats using Fe59. J Lab Clin Med. 1955; 46: 671-678. 20）Fried W, Plzak LF, Jacobson LO, Goldwasser E. Erythropoiesis. II. 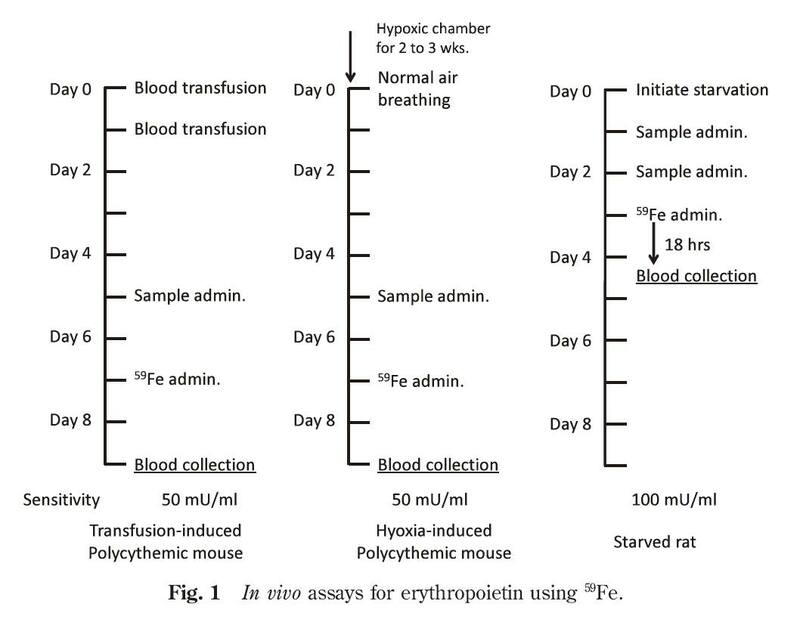 Assay of erythropoietin in hypophysectomized rats. Proc Soc Exp Biol Med. 1956; 92: 203-207. 21）Fried W, Goldwasser E, Jacobson LO, Plzak LF. Studies on erythropoiesis. III. Factors controlling erythropoietin production. Proc Soc Exp Biol Med. 1957; 94: 237-241. 22）河北誠. EPOの測定法. Lab Friends. 1989; 20: 3-10. 23）Hayakawa T, Wada M, Mizuno K, Abe S, Miyashita M, Ueda M. Simple in vivo bioassay without radioisotopes for recombinant human erythropoietins. Biologicals. 1992; 20: 243-251. 24）Cotes PM, Bangham DR. The international reference preparation of erythropoietin. Bull World Health Organ. 1966; 35: 751-760. 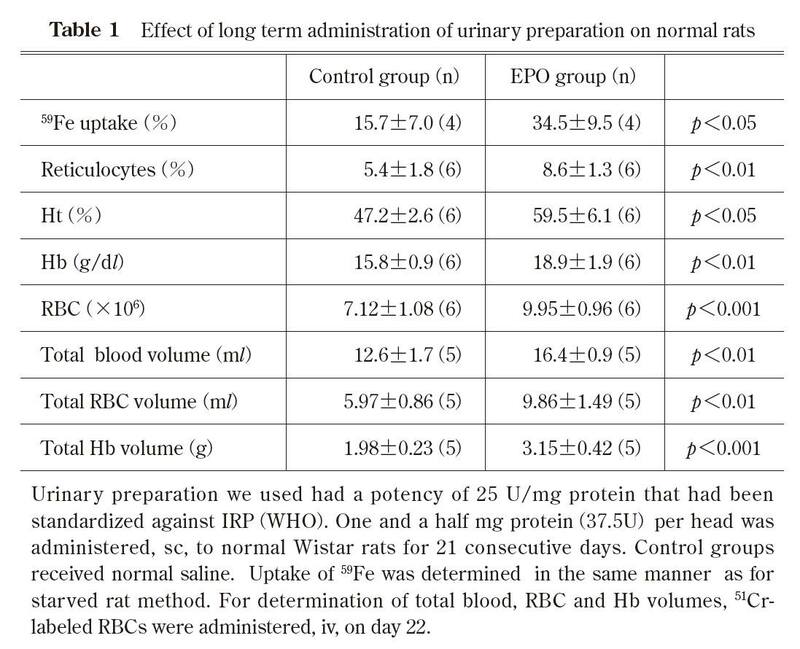 25）Borsook H, Graybiel A, Keighley G, Windsor E. Polycythemic response in normal adult rats to a nonprotein plasma extract from anemic rabbits. Blood. 1954; 9: 734-742. 26）Lowy PH, Keighley G, Borsook H. Inactivation of erythropoietin by neuraminidase and by mild substitution reactions. Nature. 1960; 185: 102-103. 27）Espada J, Gutnisky A. Purificacion de eritropoyetina urinaria humana. Acta Physiol Lat Am. 1970; 20: 122-129. 28）Espada J, Langton AA, Dorado M. Human erythropoietin: Studies on purity and partial characterization. Biochim Biophys Acta. 1972; 285: 427-435. 29）Goldwasser E, Kung CK. Purification of erythropoietin. Proc Natl Acad Sci USA. 1971; 68: 697-698. 30）島正吾, 谷脇弘茂, 嘉藤保夫, ほか. 産業企業体における血液難病に関する疫学的研究−発見患者の個別罹病調査及び予後調査を中心に. EPO厚生省特定疾患特発性造血障害調査研究班 平成7年度研究業績報告書. 1996; 99-100. 31）Kaneko F, Tajiri M, Matsubara T, Miyake T, Kawakita Y. Urinary erythropoietin. I. 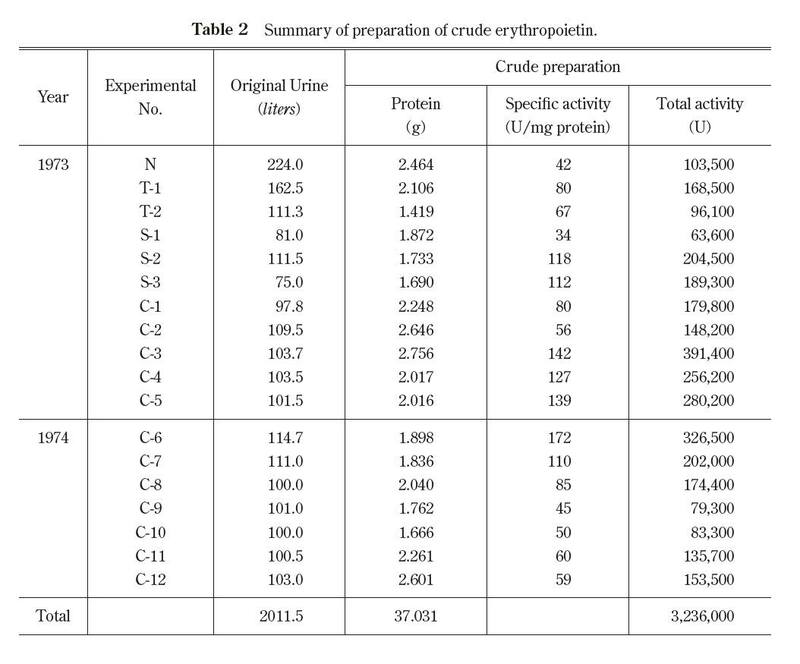 Preparation of crude erythropoietin and its biological activity. Kumamoto Med J. 1971; 24: 95-101. 32）Tajiri M, Ueda K, Miyake T, Matsubara T, Kawakita Y. Urinary erythropoietin. II. 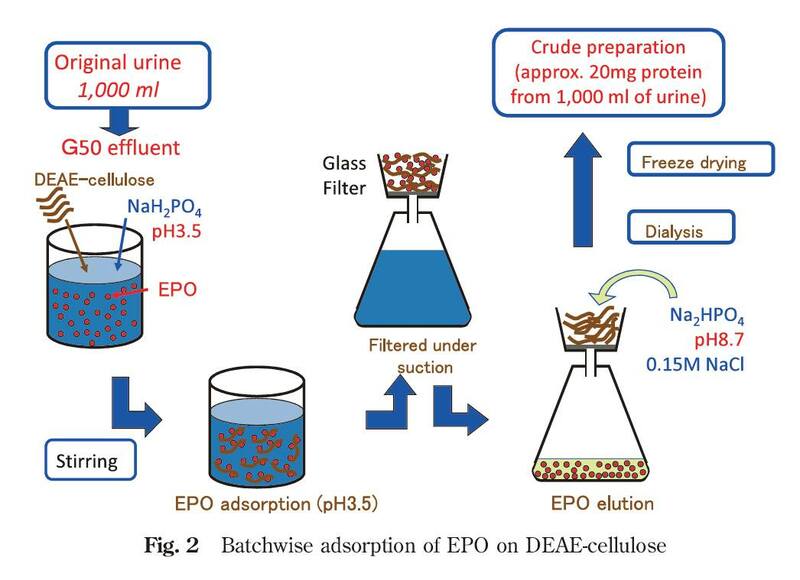 Partial purification of urinary erythropoietin. Kumamoto Med J. 1973; 26: 16-25. 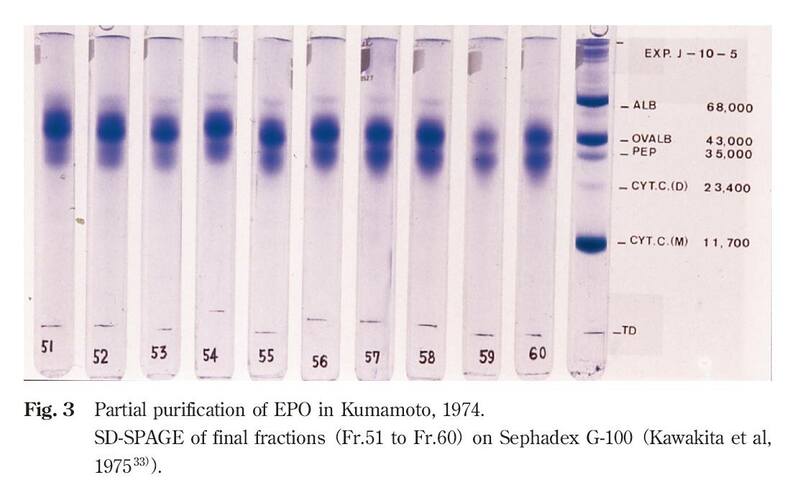 33）Kawakita M, Miyake T, Kishimoto S. Purification of urinary erythropoietin. In: Nakao K, Fisher JW, Takaku F, eds. Erythropoiesis. Tokyo, University of Tokyo Press; 1975: 55-65. 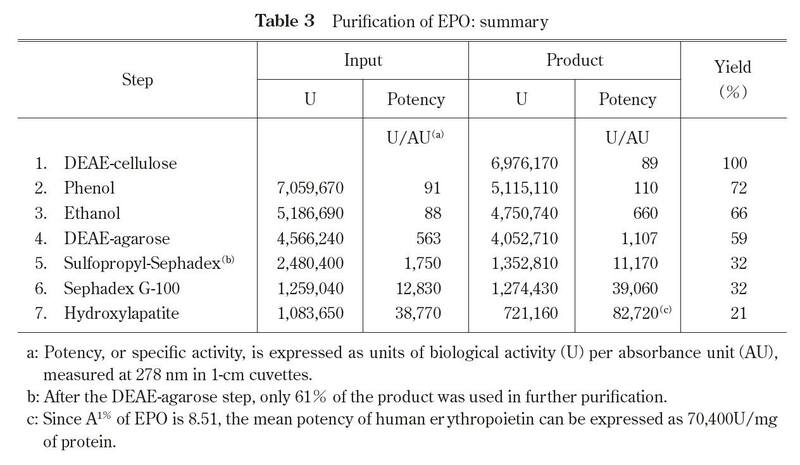 34）Goldwasser E. The purification and properties of erythropoietin: A critical review. In: Nakao K, Fisher JW, Takaku F, eds. Erythropoiesis. Tokyo, University of Tokyo Press; 1975: 75-82. 35）Chiba S, Kung CK, Goldwasser E. Stabilization of urinary erythropoietin. Biochem Biophys Res Commun. 1972; 47: 1372-1377. 36）Eschbach JW, Egrie JC, Downing MR, Browne JK, Adamson JW. Correction of the anemia of end-stage renal disease with recombinant human erythropoietin. Results of a combined phase I and II clinical trial. N Eng1 J Med. 1987; 316: 73-78. 37）The New York Times. Pollack A. Eugene Goldwasser, biochemist behind an anemia drug, dies at 88. 2010 December 20.(http://www.nytimes.com/2010/12/21/health/21goldwasser.html?_r=0). Accessed 2013 Jul 2.